I never dreamed this time that I would be addressing my fellow batch mates of 1980 and also celebrating the Holy Eucharist for our Golden Jubilarians. 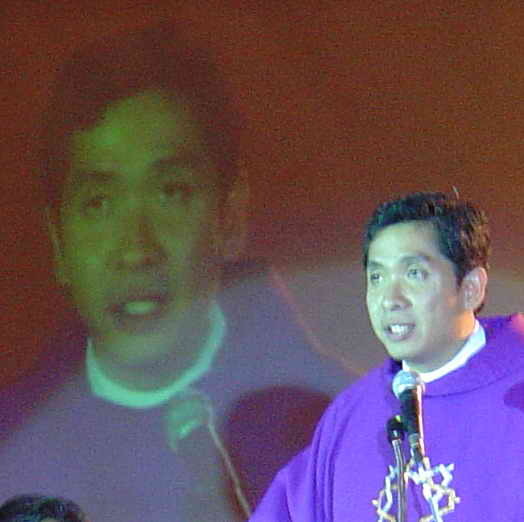 I was ordained nearly twelve years ago and I remember inviting only 1 classmate to the ordination: Francisco Lao Jr. He's not here, but it gives me great joy to share with you that while I was being ordained, I was praying for all the people who molded my life in my priesthood, and certainly, USTHIGH is part of who I am. And now, allow me to offer this mass in thanksgiving for the gift of priesthood together with all here present, batch 55, our golden jubilarians, my fellow batch mates of 1980, entire USTHS community of regents and priests, teachers, mentors, and students. Let us give everyone a warm round of applause! from Jun Baylon, who did not age at all! (a little creepy isn't it), but Jun, what's your secret??? The reminiscing really took us back to the good old days. Ang daming details that I've forgotten, and hearing your stories makes me realize how fortunate I was to be part of our batch. Talagang colorful. And this was Jun's answer: Tato, ang secret? S . hindi yung droga ha? Wholesome ako! Hep hep! Wholesome ha? S - SEBO! Remember, the last time you saw me was at least 40 pounds heavier ago! Syempre, the stretching it does to the body, per tama ka. Parang walang pagbabago, it's sill the same "rolling feeling". From Nelson Obach: are you the Nalagan, my classmate from domeng? Pre, I just want to be sure. Ang tagal na kasi. Kamusta ka na? I hope you still remember me. If I remember it right, we were always seatmates because of our last names, alphabetically arranged di ba? From Tato to Teoly: Teoly, titignan ko lang ang picture mo sa VERITAS . EYAHHH! Medyo mahal ang babayaran mo para wag kong dalhin ang yearbook. Teka lang, Makita nga ang picture ko . UTANG NA LOOB! Now I'm having second thoughts about bringing the Veritas! Another mail from Teoly to Josephine Medina Manalad: I hope you remember me, Teoly Almendras? I think we're classmates in first or second year, ako yung sing seksi ni Ressio actually mas seksi ako pero wag mo na lang sasabihin sa kanya ha? . na tahimik noon, di ba, Frances, Guia, at Titoy? I'm really amused with my classmate Jun Villamayor's letter to all: I'm Angelito G. Villamayor Jr.or Jun (St Charles). We were around 15 in our barkada and the 2 of my closest associates were Bernard Ponce (Pre, e-mailan tayo. Miss ko na yung complexion mo) and Romeo Janairo (Hoy! Nasaan ka na! Ilabas mo si TJ. Hinahanap na siya dito) Our favorite hang-out is the gotohan of Aling Ester at the back of pay-hi. I was involved in all sorts of groups--from Legion of Mary to SCA choir to Social Science Club to billiard gangs. I can often be seen in the bamboo garden in front of the hi-school building with either a guitar or the latest record album. Pareng Bernie, blonde ka na nga ba? Pare, kinikilabutan ako!!! The list goes on and on. Every time I open my email, the yahoogroups keeps on adding email addresses of our long lost classmates, until this very minute I suppose. Many things have happened since then. Many smaller reunions have been set up in the US and in Manila. We heard our classmates sing and saw them dance, feats we didn't even imagine 25 years ago. We have also prayed for our classmates and their families who encountered sicknesses, accidents, and offered masses for their beloved departed. Suddenly, our families became theirs also. Our joys and sorrows were shared by all. This reunion for me is a communion of all these. It may end this evening, but for most or all of us it's just the beginning. We don't want it to end. We don't like to let it hibernate and wait for the next 50 years for us to meet again. We want something surprising and something beautiful to always come out as a result of renewing old ties. We want to face the future with everybody around. And if I would be pursuing this life of priesthood till eternity, I want you all to be with me. 1.. Jesus makes the Samaritan woman feel important - by staying near the well and asking an ostracized person like the Samaritan woman, Jesus initiates this encounter and makes healing possible. The first word I would like to guide us starting this night is the word is REKINDLE - we would like to rekindle memories and relive them in a special way; we would like to take the initiative to reach out, to make all our batch mates, silver and golden jubilarians, feel important, and indeed, we all are special. And like this most Holy Eucharist which is a making Presence, we shall not just share old memories, but we'll make them present. It's not just the high school days. Rather, we shall be sharing the entire 25 years and make up for lost times. The kumustahan will be our language to reach out and make one another a part of our world. And we need to thank God Almighty for being able to be reunited with a classmate, a batch mate, a best friend, or a special someone. 2.. Jesus heals the Samaritan woman. Knowing her sad past, he makes an effort to assure her that despite her sinfulness, she is very much loved by God. My next key word for this evening is RECONCILE - we shall be reconciled with the past and will make extra effort to forget them. I noticed while I was reading the messages of our batch mates some memories need not surface out or would be much better buried in the past. Let me point out some examples . To Rey Espino from Peter Banes: thanks for the effort of putting up this group. Naging classmates tayo nung first year - 122. Natatandaan ko pa nga, habang nag-aantay tayong pumasok sa harap ng HS, napaaway ka pa kay Alejandro Dabu (nabasag yata yung salamin mo). Anyway regards! Si Gerald Nalagan on the day Mr. Danilo Concepcion blacklisted his name, markademonyo sa record book niya: Ayaw ko nang maalala! Or James Phil Lapuz na kinikilan sa Dapitan ngdalawang college students. I only have 5 pesos, so I told them I need to pay for something. They settled for 3 pesos, so nagsuklian pa kami sa kalsada! And of course Jun Baylon in his songfest Pippin outfit: his embarrassing moment was wearing the songfest costume, body hugging white long sleeved t shirt with rainbow sequins sa dibdib, and showing the big tummy, to top it all! 3.. It's simply because we were children, we needed to grow up, we needed to learn things the hard way. True are Marina Torres' reflections when she said, "UST days were glory for some: of recognition, plaudits, of many-a-wild amusements, sorry years for others: of rejections, nagging doubts and insecurities, but for most, if not all, an age of relative innocence and great expectations. Nevertheless, let us then, sail the river of time as we try to bridge the wide, gapping years that saw us from what we were then to who we are now. With relief and a dollop of humor, let us allow the memories to trickle as the events slowly unfold, pondering the lessons learned as we let the hurts sift through the fiber of character the years have woven into us." 4.. Finally, as the Samaritan becomes transformed into an active proclaimer after having found new life in Jesus, let us also recommit ourselves to the cause that we once dreamed about when we left USTHS: that we would contribute our share in building our country and be the future apostles of the Lord. The third word I propose is the word RECOMMIT - we recommit to excel in our fields of endeavor, we recommit to sharing our talents with one another, we recommit to help our ailing country get back on its feet. We vow to be healers from now on. There's a reason why the Lord enabled us to meet once again after 25 years: to realize that the future we once cherished is already in front of us - that future is today. And today is not a beautiful sight to see, as our country is beset by widespread poverty and corruption. Where are we in this great unfolding of history? I was very much inspired with a conversion I had with Gina Bautista Navarette and realized that despite all her successes she just wants to go back and enjoy the simplest things in life. She said, "One source of joy I experienced is whenever we open a restaurant, we provide employment opportunities to people, they have something to hope for." Then she further shared, "I have enough for my family, I hope to go back to school and teach." I know that there are a lot more success stories like Gina. I also commend Rene Molano when he told me he engages in mass-based free seminars to empower people in far flung areas. I commend everyone for every sign of fruitfulness abounding left and right. I would pray that this may be the most relevant time for us to continue meeting and collaborating all our efforts, and probably offer our lives to bring hope to others. Then we can meet in the next fifty years, and like our golden jubilarians, look and feel as young and as energetic as ever. Let us give a warm round of applause to our golden jubilarians! 5.. In closing, as we look back through all these years and journey toward the future, let us realize that it is not just the story of our high school memories. It is ultimately the story of our lives finding its true meaning in God. And we have every reason to celebrate it through this reunion. To everyone, mabuhay and may God bless us all!